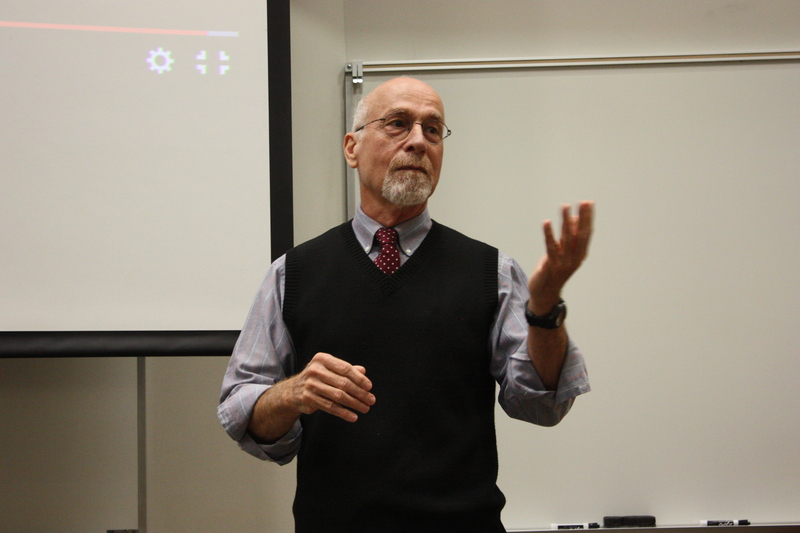 Visiting professor Robert Cancel shared his findings from studying the storytelling traditions of Zambia firsthand. PROVO, Utah (March 3, 2016)—Storytelling isn’t unique to any single culture, and similar motifs and characters pop up everywhere that humans have gathered round fires to share. Written down, these stories have given researchers plenty to analyze in terms of culture and the human experience. But written narratives leave out a crucial element: the storytellers themselves. Since 1976, Cancel has made numerous visits to Zambia to study the people’s oral narrative traditions, meeting one-on-one with storytellers and recording their words. In a visit to BYU, Cancel shared portions of his research that appear in his latest book, Storytelling in Northern Zambia: Theory, Method, Practice and Other Necessary Fictions. “To understand what stories mean in an oral tradition, you have to understand that they function within a system,” Cancel explained. Context is everything: Who is telling the story? Where is it being told? What events are taking place around the time of the telling? What are the politics? Does the audience number in the hundreds or is it a single person? Though the details of a story may not necessarily change, the conditions of a telling can change its meaning. Another key to interpreting oral traditions is understanding that no story has an official version. Cancel explained that oral narratives are fluid in nature and adapt to the conditions they find themselves in. Even the Grimm Brothers collected hundreds of versions of individual fairytales before eventually writing their own versions down. So when folklorists study a specific telling of a story, they do so having first read other tellings, interpreting meaning from the variations they identify. Ultimately, the storyteller has the most influence over the story’s meaning. To illustrate, Cancel shared a video clip of Henry Chakobe – one of Cancel’s interviewees – telling a story about a hare fooling a bushbuck. The story is one example of trickster tales told throughout Africa. These stories concern typically amoral figures who do as they please at the expense of others, often with humorous outcomes, and almost always with a moral attached. Though Cancel had heard many stories that were similar to or variations of Chakobe’s, the story managed to stick out. Typically with trickster tales, the moral is either obvious or the audience has no interest in hearing it, so it goes unsaid. But Chakobe made sure to explain the story’s moral at the end, a move that makes little sense without understanding the context. At the time Chakobe told the story, Pope John Paul II was visiting the country, so religion and morality were hanging heavily on the minds of teachers like Chakobe. A friend of Chakobe’s who spoke before him likewise told a variant of the well-known story, adding a religious interpretation at the end. Cancel’s book is open access and free to read online. For more information and to watch videos of oral narratives, visit Open Book Publishers.